January 1, 2018 "Instructions For Irs Forms 1096, 1097, 1098, 1099, 3921, 3922, 5498, And W-2g" contain the updated filing procedures for the IRS-issued Form 1096. Download your copy of the instructions by clicking the link below. IRS Form 1096 is a tax form issued by the United States Internal Revenue Service. for the new mailing address. addition of two new forms due to P.L.115-97. separate instructions has been added where appropriate. reportable death benefits after December 31, 2017. Due date for certain statements sent to recipients. for due dates for all returns. instructions for each form on the webpage via the link. 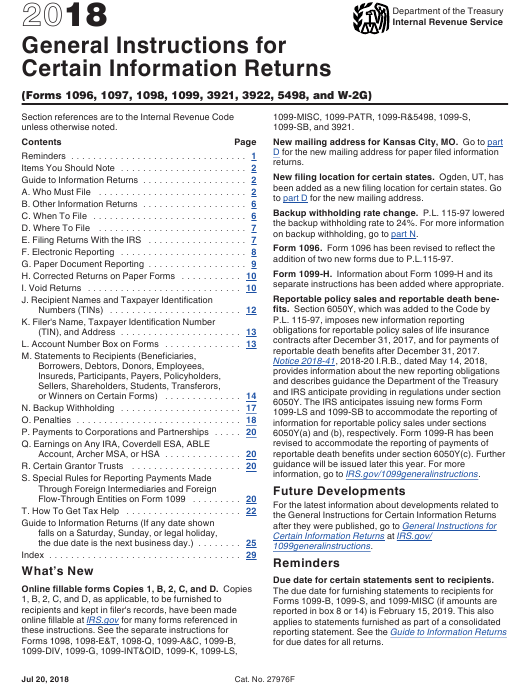 1096, Annual Summary and Transmittal of U.S.
and Form 1096, Annual Summary and Transmittal of U.S.
the “For Official Use Only” entry spaces. 800-THE-LOST (800-843-5678) if you recognize a child. substitute statements comply with the rules in Pub. 1179.
the following list of separate instructions. Instructions for Forms 1098-E and 1098-T. Instructions for Forms 1099-A and 1099-C. Instructions for Forms 1099-QA and 5498-QA. Instructions for Forms 1099-R and 5498. Instructions for Forms 1099-SA and 5498-SA. See the separate specific instructions for each form. Instructions for Forms 3921 and 3922. Instructions for Forms W-2G and 5754. Forms 1099 to show the amount allocable to each owner. information explaining the combined reporting. separate unit of a trade or business of the predecessor. Instructions for Form 1042-S; see Rev. Proc. 99-50.
year of acquisition for the period before the acquisition. of acquisition for the period after the acquisition. is also subject to information reporting requirements. separate instructions for more information. If you are required to report an account that is a U.S.
instead of on Form 8966, FATCA Report. ar05.html. TD 9249 relates to escrow and similar funds. furnished to trust interest holders (TIHs). a trust holder's interest in the WHFIT must be reported. You are required to report the account as a U.S. The account is a U.S. account held by a specified U.S.
1099-B. See Regulations section 1.671-5(d). business or by location where the account is maintained). furnished to the TIH is due on or before March 15, 2019.
tions section 1.1471-4(d)(2)(iii)(A). If you are a U.S.
reported to the TIH, see Regulations section 1.671-5(c). 1099-MISC. See the Instructions for Form 1099-MISC. determine which form to file. sections 6041, 6042, 6045, and 6049 if you were a U.S.
including how to obtain an EIN. payments as a payer under chapter 61. (2)(iii)(A) or (d)(5)(i)(A) or (B). The name, address, and TIN of the account holder. specific instructions for each form. reporting on the applicable Form 1099). If you are a sponsoring entity that is reporting a U.S.
cash value insurance contract and annuity contract. means a foreign entity that is a financial institution. For the address, enter the sponsoring entity’s address. is an FFI described in Regulations section 1.1471-5(f)(3). enter the sponsored FFI’s EIN. code “1” in the “Transfer Agent Indicator” field. See Pub. than a branch that is a reporting Model 1 FFI or a U.S.